My rating in words: I really liked it! When he sees his cabin at Camp Half-Blood, filled with power tools and machine parts, he feels right at home. But there’s weird stuff, too—like the curse everyone keeps talking about, and some camper who’s gone missing. Weirdest of all, his bunkmates insist that each of them—including Leo—is related to a god. Does this have anything to do with Jason’s amnesia, or the fact that Leo keeps seeing ghosts? Buddy read with the lovely Uma of Books. Bags. Burgers. Thanks for an amazing first buddy read, Uma! You can check out her review here. It only took me about 7 years, but I finally, finally started this series! A big thank you to Uma of Books. Bags. Burgers for suggesting a buddy read to get me to finally stop procrastinating! Let’s talk characters first, shall we? One of my favorite changes in this new series has been the inclusion of multiple POV’s as it allowed us to really get to know all three main characters so well. Though I must admit that I started the book missing Percy’s voice a lot. He is one of my all-time favorite main characters, so I was a bit worried if I could grow to like all these new characters instead. But I shouldn’t have worried. I especially fell in love with both Piper and Leo immediately. Piper is feisty, strong and very caring. I loved her relationship with her dad and her interactions with her cabin mates. Leo is smart, sassy and funny and I loved his thoughts and his relationship with his pet dragon. Well, most of my favorite quotes are Leo, so that’s saying something. Jason was my least favorite of the three, even though he grew on me. He felt really bland, lacking in personality and just your standard great hero to me. But of course, this probably had a lot to do with his amnesia so I’m still giving him the benefit of the doubt for the rest of the series and I’m sure I’ll grow to love him as well. On top of the new trio, we also get to meet some of the characters from the previous series again and boy, you have no idea how happy that made me! I just love these characters so much, I could read about them forever. The world building is of course another great point of Rick Riordan books. He already created such an amazing world with Percy Jackson and the Olympians and he just keeps surprising me by expanding the world even more. More gods, more villains, more myths, more creatures, more surprises, more mystery,… There’s just so much more, more, more! Though I can’t go into details because of spoilers (though really, this has been out for 7 years already. I can’t believe I managed not to get spoiled myself), I loved the way Rick Riordan expanded the mythology. He had me guessing and speculating throughout the entire book, and when the ending came it all felt so obvious and clear, like I should have thought about this from the beginning. But I didn’t so I still got the surprise effect! The writing style and the plot are similar to Percy Jackson. If you loved that series, I’m pretty confident you’ll love this book as well. I mean, what’s not to love about a couple of demigods going on a quest together, meeting monsters and gods along the way, getting themselves in lots of dangerous situations, with a ton of humor thrown in? Sure, the premise is pretty familiar, but that doesn’t make it any less fun. I just must recommend this book to anyone who loved the Percy Jackson series and wants more. Though it’s not my favorite Rick Riordan yet, I’m pretty confident the rest of the series will only get better and better so I’m saving my five-star rating just a tiny bit longer. 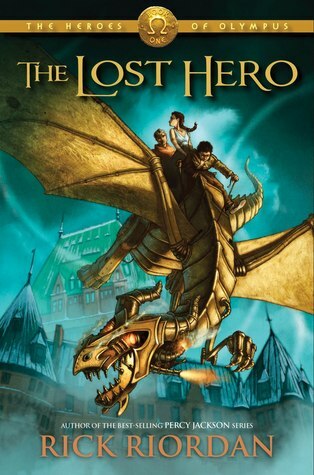 Have you read The Lost Hero? What did you think about it? Buddy Reads are so amazing indeed! I totally understand about bossy buddy reads – though my buddy read wasn’t bossy really, it was still a perfect way to get me to read a book I might have procrastinated indefinitely otherwise 🙂 Red Rising has been on my TBR for ages, so a buddy read would have been handy for that one as well – so happy to hear you loved it! I really should start some of Rick Riordan’s series. They really do look like a lot of fun! They are super fun 🙂 Hope you’ll enjoy them when you get to them! I still need to finish the Percy Jackson and the Olympians series. I only have 2 books left to read so hopefully it won’t take me too long because this series sounds great too! I always love a Riordan and I love his diversity and writing style – light and easy and yet longer and deeper than you might initially think. Love your reviews guys and can’t wait to read more as you go through the series! Exactly! I love your description of Rick Riordan’s writing style, it’s so spot on! I really should stop procrastinating as well and read the Percy Jackson books to read this one. Great Review, made me want to read the book! Definitely highly recommend the Percy Jackson books and the Heroes of Olympus series so far 🙂 Hope you’ll enjoy when you get to them! Ah, yay! So glad you’re starting this series. I think it does take a bit longer to get into but AHH JUST WAIT UNTIL MARK OF ATHENA AND HOUSE OF HADES YOU WON’T BE READY!!! Glad you enjoyed it and great review, Lindsey!! I have yet to read these as well and I need to start too. This sounds so good and it makes me want to pick them up. I have a few of the first ones but someone stole… I mean borrowed them. 🙂 Soon… 🙂 Brilly review!